About a month ago I heard that Mike from Dead Broke Records, a small label here on LI, wanted to release an album called Explosivo! If the devil had a guitar. This album was recorded about 10 years ago and just got buried. 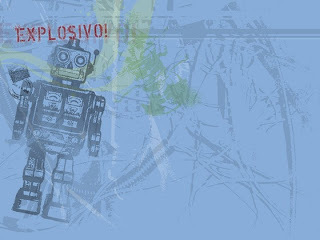 Explosivo then broke up and the members formed bands like Iron Chic, Small Arms Dealer, and The Devil Himself. Well for a while Tom and I have really wanted to contribute and help out the LI scene with a small label that released LI bands. Unfortunately, we really don't have the time to run our own label. While it seems easy to just "start a label!" it's a rather frustrating process that can really consume a lot of your life. And I have no life to spare right now. So instead we decided to just seek out projects that we like from labels/bands on LI that are looking for a little help with promotion or money. Well Mike was using Kickstarter for this project, so I thought maybe he needed some help. I know it's tough to press a 10 year old album, from a band that broke up, and basically never heard of when they were around ahha. Seemed like this was the perfect opportunity to help out a buddy of mine and start the ball rolling on the "supporting LI from the inside" project. So I contacted Mike, told him we could go half, and blingo! Explosivo - If the Devil Had a Guitar was a go. It's going to be a pretty limited vinyl release. Not sure of the number right now. Maybe 250-350. 1 color and 1 black I think. Handmade covers and artwork like only DBR can do. Should be very fun. I'm really excited to see it happen. I have a full stream of this album up on the Limited Pressing homepage if you'd like to listen. The band sounds something like Iron Chic or Latterman. If you're familiar with this genre of music, which is basically modern pop punk, I think you'll be impressed by how long ago this album was recorded, and how new the style sounds. A lot of bands now a days are using that Chuck Ragan type of vocals. But this was 10 years ago. Very ahead of their time. So give it a shop if you got a few minutes. Thanks a lot!